There is no bilaterally-symmetrical, nor eccentrically-periodic curve used in any branch of astrophysics or observational astronomy which could not be smoothly plotted as the resultant motion of a point turning within a constellation of epicycles, finite in number, revolving around a fixed deferent. …and thus I was drawn into the world of epicycles and fractals. Epicycles were first used by the Greeks to reconcile observational data of the motions of the planets with the theory that all bodies orbit the Earth in perfect circles. It was found that epicycles allowed astronomers to retain their belief in perfectly circular orbits, as well as the centrality of Earth. The cost of this, however, was a system with many adjustable parameters (as many parameters as there were epicycles). There’s a somewhat common trope about adding on endless epicycles to a theory, the idea being that by being overly flexible and accommodating of data you lose epistemic credibility. This happens to fit perfectly with my most recent posts on model selection and overfitting! The epicycle view of the solar system is one that is able to explain virtually any observational data. (There’s a pretty cool reason for this that has to do with the properties of Fourier series, but I won’t go into it.) The cost of this is a massive model with many parameters. The heliocentric model of the solar system, coupled with the Newtonian theory of gravity, turns out to be able to match all the same data with far fewer adjustable parameters. So by all of the model selection criteria we went over, it makes sense to switch over from one to the other. Here’s a general question of great importance: How should we adjust our model of the world in response to data? This post is a tour of a few of the big ideas that humans have come up with to address this question. I find learning about this topic immensely rewarding, and so I shall attempt to share it! What I love most of all is thinking about how all of this applies to real world examples of inference from data, so I encourage you to constantly apply what I say to situations that you find personally interesting. First of all, we want a formal description of what we mean by data. Let’s describe our data quite simply as a set: , where each is a value that you choose (your independent variable) and each is the resulting value that you measure (the dependent variable). Each of these variables can be pretty much anything – real numbers, n-tuples of real numbers, integers, colors, whatever you want. The goal here is to embrace generality, so as to have a framework that applies to many kinds of inference. Now, suppose that you have a certain theory about the underlying relationship between the x variables and the y variables. This theory might take the form of a simple function: We interpret T as making a prediction of a particular value of the dependent variable for each value of the independent variable. Maybe the data is the temperatures of regions at various altitudes, and our theory T says that one over the temperature (1/T) is some particular linear function of the altitude. What we want is a notion of how good of a theory T is, given our data. Intuitively, we might think about doing this by simply assessing the distance between each data point and the predicted value of y at that point: , using some metric, then adding them all up. But there are a whole bunch of distance metrics available to us. Which one should we use? Perhaps the taxicab measure comes to mind ( ), or the sum of the squares of the differences ( ). We want a good theoretical justification for why any one of these metrics should be preferred over any other, since in general they lead to different conclusions. We’ll see just such justifications shortly. Keep the equation for SOS in mind, as it will turn up repeatedly ahead. Now here’s a problem: If we want a probabilistic evaluation of T, then we have to face the fact that it makes a deterministic prediction. Our theory seems to predict with 100% probability that at the observed will be precisely . If it’s even slightly off of this, then our theory will be probabilistically disconfirmed to zero. We can solve this problem by modifying our theory T to not just be a theory of the data, but also a theory of error. In other words, we expect that the value we get will not be exactly the predicted value, and give some account of how on average observation should differ from theory. , where is some random variable drawn from a probability distribution . This error distribution can be whatever we please – Gaussian, exponential, Poisson, whatever. For simplicity let’s say that we know the error is normal (drawn from a Gaussian distribution) with a known standard deviation σ. A note on notation here: denotes a random variable drawn from a Gaussian distribution centered around with a standard deviation of . This gives us a sensible notion of the probability of obtaining some value of y from a chosen x given the theory T.
Nice! This is a crucial step towards figuring out how to evaluate theories: we’ve developed a formalism for describing precisely how likely a data point is, given a particular theory (which, remember, so far is just a function from values of independent variables to values of dependent variables, coupled with a theory of how the error in your observations works). Let’s try to extend this to our entire data set D. We want to assess the probability of the particular values of the dependent variables, given the chosen values of the dependent variables and the function. We’ll call this the probability of D given f.
But now we run into a problem: we can’t really do anything with this expression without knowing how the data points depend upon each other. We’d like to break it into individual terms, each of which can be evaluated by the above expression for . But that would require an assumption that our data points are independent. In general, we cannot grant this assumption. But what we can do is expand our theory once more to include a theory of the dependencies in our data points. For simplicity of explication, let’s proceed with the assumption that each of our observations is independent of the others. Said another way, we assume that given T, screens off all other variables from ). Combined with our assumption of normal error, this gives us a nice simple reduction. We see an interesting connection arise here between Pr(D | f) and the sum of squares evaluation of fit. More will be said of this in just a moment. But first, let’s take a step back. Our ultimate goal here is to find a criterion for theory evaluation. And here we’ve arrived at an expression that looks like it might be right for that role! Perhaps we want to say that our criterion for evaluating theories is just maximization of Pr(D | f). This makes some intuitive sense… a good theory is one which predicts the observed data. If general relativity or quantum mechanics predicted that the sun should orbit the earth, or that atoms should be unstable, then we wouldn’t be very in favor of it. And so we get the Likelihoodism Thesis! Thus the best theory according to Likelihoodism is that which minimizes the sum of squares! People minimize sums of squares all the time, and most of the time they don’t realize that it can be derived from the Likelihoodism Thesis and the assumptions of Gaussian error and independent data. If our assumptions had been different, then we would have found a different expression, and SOS might no longer be appropriate! For instance, the taxicab metric arises as the correct metric if we assume exponential error rather than normal error. I encourage you to see why this is for yourself. It’s a fun exercise to see how different assumptions about the data give rise to different metrics for evaluating the distance between theory and observation. In general, you should now be able to take any theory of error and assess what the proper metric for “degree of fit of theory to data” is, assuming that degree of fit is evaluated by maximizing Pr(D | f). Now, there’s a well-known problem with the Likelihoodism thesis. This is that the function f that minimizes SOS(f, D) for some data D is typically going to be a ridiculously overcomplicated function that perfectly fits each data points, but does terribly on future data. The function will miss the underlying trend in the data for the noise in the observations, and as a result fail to get predictive accuracy. This is the problem of overfitting. Likelihoodism will always prefer theories that overfit to those that don’t, and as a result will fail to identify underlying patterns in data and do a terrible job at predicting future data. Bayesianism: The best theory f given some data is that which maximizes Pr(f | D). Now, what is this Pr(f | D) term? It’s an expression that we haven’t seen so far. How do we evaluate it? We simply use the theorem that the thesis is named for: Bayes’ rule! This famous theorem is a simple deductive consequence of the probability axioms and the definition of conditional probability. And it happens to be exactly what we need here. Notice that the right-hand side consists of the term Pr(D | f), which we already know how to calculate. And since we’re ultimately only interested in varying f to find the function that maximizes this expression, we can ignore the constant term in the denominator. The last steps we get just by substituting in what we calculated before. The 2σ² in the first term comes from the fact that the exponent of our Gaussian is (y – f(x))² / 2σ². We ignored it before because it was just a constant, but since we now have another term in the expression being maximized, we have to keep track of it again. Notice that what we get is just what we had initially (a sum of squares) plus an additional term involving a mysterious Pr(f). What is this Pr(f)? It’s our prior distribution over theories. Because of the negative sign in front of the second term, a larger value of Pr(f) gives a smaller value for the expression that we are minimizing. Similarly, the more closely our function follows the data, the smaller the SOS term becomes. So what we get is a balance between fitting the data and having a high prior. A theory that fits the data perfectly can still end up with a bad evaluation, as long as it has a low enough prior. And a theory that fits the data poorly can end up with a great evaluation if it has a high enough prior. What this means is that if we are trying to solve overfitting, then the Bayesianism thesis provides us a hopeful ray of light. Maybe we can find some perfect prior Pr(f) that penalizes complex overfitting theories just enough to give us the best prediction. But unsurprisingly, finding such a prior is no easy matter. And importantly, the Bayesian thesis as I’ve described it gives us no explicit prescription for what this prior should be, making it insufficient for a full account of inference. What Bayesianism does is open up a space of possible methods of theory evaluation, inside which (we hope) there might be a solution to our problem. Okay, let’s take another big step back. How do we progress from here? Well, let’s think for a moment about what our ultimate goal is. We want to say that overfitting is bad, and that therefore some priors are better than others insofar as they prevent overfitting. But what is the standard we’re using to determine that overfitting is bad? 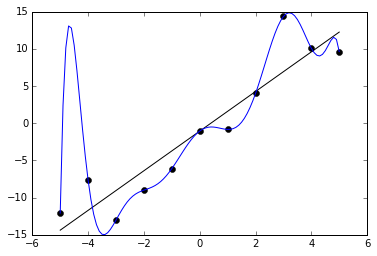 What’s wrong with an overfitting theory? Here’s a plausible answer: The problem with overfitting is that while it maximizes descriptive accuracy, it leads to poor predictive accuracy! I.e., theories that overfit do a great job at describing past data, but tend to do a poor job of matching future data. Predictivism: The ultimate standard for theory evaluation is predictive accuracy. I.e., the best theory is that which does the best at predicting future data. Predictivism is a different type of thesis than Bayesianism and Likelihoodism. While each of those gave precise prescriptions for how to calculate the best theory, Predictivism does not. If we want an explicit algorithm for computing the best theory, then we need to say what exactly “predictive accuracy” means. This means that as far as we know so far, Predictivism could be equivalent to Likelihoodism or to Bayesianism. It all depends on what method we end up using to determine what theory has the greatest predictive accuracy. Of course, we have good reasons to suspect that Likelihoodism is not identical to Predictivism (Likelihoodism overfits, and we suspect that Predictivism will not) or to Bayesianism (Bayesianism does not prescribe a particular prior, so it gives no unique prescription for the best theory). But what exactly Predictivism does say depends greatly on how exactly we formalize the notion of predictive accuracy. Another difference between Predictivism and Likelihoodism/Bayesianism is that predictive accuracy is about future data. While it’s in principle possible to find an analytic solution to P(D | f) or P(f | D), Predictivism seems to require us to compute terms involving future data! But these are impossible to specify, because we don’t know what the future data will be! Can we somehow approximate what the best theory is according to Predictivism, by taking our best guess at what the future data will be? Maybe we can try to take the expected value of something like , where is a future data point. But there are two big problems with this. First, in taking an expected value, you must use the distribution of outcomes given by your own theory. But then your evaluation picks up an inevitable bias! You can’t rely on your own theories to assess how good your theories are. So is there any way out of this? Surprisingly, yes! If we get creative, we can find ways to approximate this probability with some minimal assumptions about the data. These methods all end up relying on a new concept that we haven’t yet discussed: the concept of a model. The next post will go into more detail on how this works. Stay tuned! Somebody recently referred me to a 1994 paper by George Boolos in which he writes out a description of Gödel’s Second Incompleteness Theorem, using only words of one syllable. I love it so much that I’m going to copy the whole thing here in this post. Enjoy! First of all, when I say “proved”, what I will mean is “proved with the aid of the whole of math”. Now then: two plus two is four, as you well know. And, of course, it can be proved that two plus two is four (proved, that is, with the aid of the whole of math, as I said, though in the case of two plus two, of course we do not need the whole of math to prove that it is four). And, as may not be quite so clear, it can be proved that it can be proved that two plus two is four, as well. And it can be proved that it can be proved that it can be proved that two plus two is four. And so on. In fact, if a claim can be proved, then it can be proved that the claim can be proved. And that too can be proved. Now, two plus two is not five. And it can be proved that two plus two is not five. And it can be proved that it can be proved that two plus two is not five, and so on. Thus: it can be proved that two plus two is not five. Can it be proved as well that two plus two is five? It would be a real blow to math, to say the least, if it could. If it could be proved that two plus two is five, then it could be proved that five is not five, and then there would be no claim that could not be proved, and math would be a lot of bunk. So, we now want to ask, can it be proved that it can’t be proved that two plus two is five? Here’s the shock: no, it can’t. Or, to hedge a bit: if it can be proved that it can’t be proved that two plus two is five, then it can be proved as well that two plus two is five, and math is a lot of bunk. In fact, if math is not a lot of bunk, then no claim of the form “claim X can’t be proved” can be proved. So, if math is not a lot of bunk, then, though it can’t be proved that two plus two is five, it can’t be proved that it can’t be proved that two plus two is five. By the way, in case you’d like to know: yes, it can be proved that if it can be proved that it can’t be proved that two plus two is five, then it can be proved that two plus two is five.